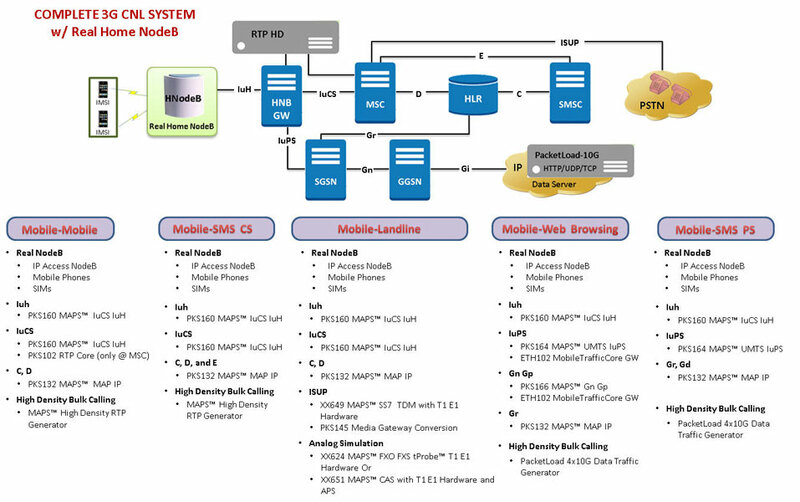 GL offers an MAPS™ Wireless Network Simulation Test Suite with all components such as Home NodeB, Home NodeB Gateway, and UMTS core network elements such as RNC, MSC, and HLR for CS traffic emulation (mobile voice call/SMS) and also core elements such as SGSN, and GGSN to support packet traffic emulation. The simulation includes both User Plane and Control Plane; circuit-switched voice/sms and packet-switched data traffic simulation, resembling real user activity (like web-browsing). One can setup a complete virtual real-time network simulating all the network elements, or any of the network elements in the above architecture can be replaced with user's DUT to perform single interface, multi-interface, or wrap-around testing. Complex scenarios such as handovers can be achieved easily. Simulate multiple instances of nodes in network such as RNC, MSC, HLR, SGSN, and GGSN to perform functional and load/stress testing. Verify your latest web services and mobile features over the network with various types of traffic generators and receivers. In addition, with MAPS™ HD RTP appliance you can generate high call intensity (hundreds of calls/sec) and high volume Voice and SMS calls (thousands of simultaneous calls/platform). 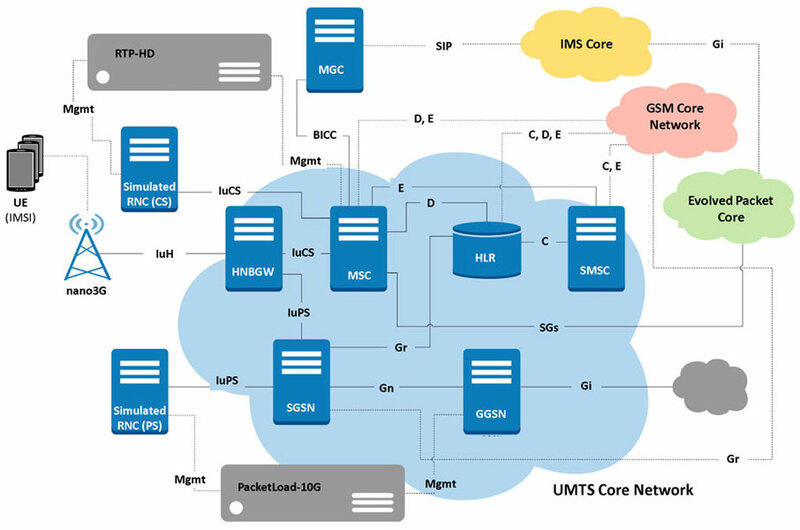 For stateful high density packet traffic (TCP/HTTP, UDP, and PCAP Replay) generation MAPS™ PacketLoad™appliance can be used to support massive simulation of UEs (up to 500000) with high density (up to 4 Gbps or 40 Gbps) mobile data traffic for both UMTS, and LTE networks. What you need for setting up 3G Lab?